Volunteer construction crew working on a basement upgrade. 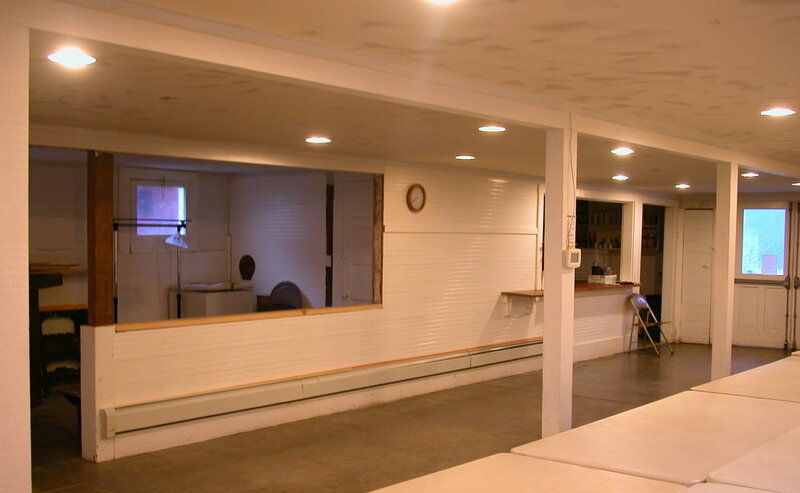 One night when the Rejuvenation plans were still a distant, unformed dream, our volunteer construction team was working in the basement with intentions of changing an awkward, full-height wall to a lower pony wall. This would, we knew, visually expand the dark, unappealing room. None of us had, in these early days, a conceptual plan for the basement meeting room. It was an almost-left-over space, completely utilitarian, ugly and claustrophobic with little natural light and seven-foot ceilings. An afterthought of a room compared to the simple-but-dignified upstairs hall, the space is traditionally used for little more than informal meetings and fundraising breakfasts. There was nothing approaching a master plan then, and in an evening the job was done. The wall was gone, making the room feel more open and rendering it more functional. And with the room-dividing wall gone, it became easy to imagine making the most of the south wall with its exposure to the Buckeye Lot and to the natural light the room was so lacking. This simple story epitomizes the way the building has been used and altered for all its years. It echoes the organic way so many family houses evolve over generations, as any well-used building should. Various collections of volunteers—from the pioneers to our energetic team of today—have borrowed time from their day jobs and their businesses to make a difference to this, the community building we all share. It is no wonder that the place feels so familiar.